I read an excellent piece this morning in the New York Times written by Greg Smith about why he was leaving Goldman Sachs. In short, he says it’s become too sleazy as short-term profit motives are now trumping all other considerations. In the past 2.5 years I’ve been investing in real estate in my home town Pueblo, Colorado. What I’ve found is that large banks are dragging out the foreclosure process so that homes are left vacant for 18 months or more. This is bad for everyone. It’s bad for the banks because while the homes sit vacant they deteriorate and lose value. 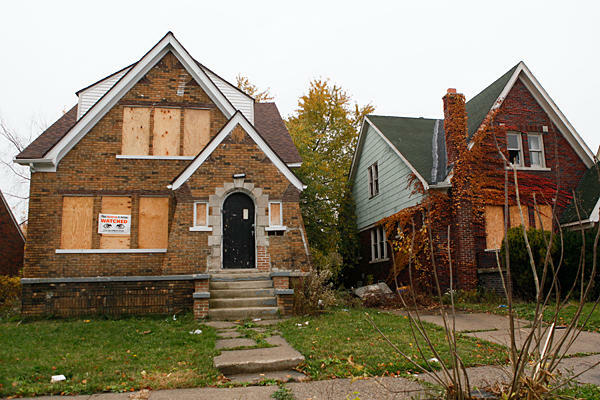 It’s bad for the neighborhood because it drives down prices and vacant homes invite criminal activity. It’s bad for local government because the value decline results in lower revenue while additional criminal activity requires higher expenditures. It’s bad for investors and prospective buyers because they have to spend more money on repairs. It’s bad for renters because the reduced housing inventory decreases supply and drives up rental costs. I’ve read a smattering of articles about the “shadow inventory” and everyone seems to accept what the banks are doing. The argument seems to be that holding back the houses is reasonable behavior because the banks don’t want to “flood the market” and drive prices lower than they’ve fallen already. What a crock. and, they don’t want to take the ensuing haircut on their stock prices. In other words, their actions are driven by short-term greed just like Greg Smith’s description of the culture at Goldman Sachs. I would love to do an analysis to demonstrate the correlation between slow-moving foreclosures and crime but the raw data aren’t readily available or they cost too much from providers like CoreLogic and RealtyTrac. The federal government could help by requiring that these banks – who owe their survival to taxpayers – disclose all the details of their foreclosure inventory (addresses, amount owed, estimated value, square footage, bedrooms, baths, etc) and post it to data.gov or some other central repository where anyone can download the data for analysis. This would allow everyone, including Wall Street, to more readily assess the losses that will be coming when the homes are liquidated by the banks. If the banks are no longer able to hide their impending losses, hopefully they’ll do a better job of processing foreclosures more efficiently so American neighborhoods can begin to recover. 2008, Bank bail out. Banks now under Federal Government control. This is what happens when the government get involved in the housing market. Please tell me you know that a bank wouldn’t leave it’s assets alone for 18 months unless the government was paying for it. The same thing happens when a farmer leaves acres of fertile ground fallow, they are getting paid by the government to do so. Justin, please. Are you really that naive? There is enough naivete to go all around. This is not a simple/linear problem, and the analogy to the CRP program is completely off base. What is true- The Fed and the FDIC have been walking a fine line when it comes to tolerating banks refusing to recognize losses on loans and their now owned real estate. They do not want to take over any more banks, they do not want to have to get any more involved in the commerce of merging financial institutions, and that is exactly the outcome when these institutions face capital shortfalls arising from too many failed loans being recognized all at once. it is also important to separate the community banking situation from the “BIg” regional and national banks. The regulatory environment is quite different, and it favors size. The FDIC has to rely on B of A / Chase/Citibank/Wells Fargo to tell them what their loan portfolio looks like, or at best they can randomly sample, but in a community bank’s safe and soundness exam 2x a year, they have to provide access to every loan and every client file for examination. You can see the outcome of this disparity when you look at how many small banks have been closed by the FDIC and their assets sold to other banks, which become too big to undergo the same scrutiny. There has to be some common sense in how this is all unwound. Pulling the plug on the banking system will wreak havoc on all our lives. Change the regulations that encourage banks getting bigger, and ease capital requirements on smaller banks. Alter the process for how bad loans and declining property values affect the portfolios of banks, and make sure the solution still encourages banks to stop holding inventory. This problem can be fixed, but the regulations have to change. the key word here is regulation, not legislation. We spend/lose far more tax dollars when a bank fails than would have been expended in getting it stabilized and into new ownership, and we can’t keep printing money to give to the FDIC to continue down this path. Some great comments here, It is good to see the depth of knowledge this issue is reaching within the real estate community. Unfortunately, like so many of the challenges we face, it is not easily or quickly fixed, and our political system is not functioning in a way that we can thoughtfully remedy things like this. As a nation we have little patience for taking time to solve large problems that require cooperation and in depth understanding. We need to change this and I am not sure we can. It appears that a seemingly never ending struggle between the abundant citizen population that have valid desires and lack of sufficient data, multiple layered business with varying levels of accountability and legislation, and federal/state government with massive influence, control, and fiscal irresponsibility continues onward. Until the people in each of these realms are willing to lay down certain desires, privileges, and preferences to consider what is best for society now and in the future and step up to the necessary sacrifices and responsibilities, the answers/solutions will never be achieved. Thanks for the comment! I agree that it will be a challenge until more of these constituencies are willing to sacrifice in the short term in order to achieve long-term objectives. real estate property from 2013 on? Thanks for any thoughts on that subject. Larry, thank you for your comment! Glad to hear you’re enjoying the discussion. I read a little bit about the ObamaCare tax on on real estate. The tax only applies above a certain income level, e.g., $250,000 for couples filing jointly and $200,000 for individuals/others. And, the tax only kicks in on a primary residence if the gain in equity is over $500,000. Not too many real estate transactions will qualify anytime soon. Here’s a reasonably good article with a few more details and an example: http://www.snopes.com/politics/taxes/realestate.asp. As far as this tax impacting banks who are selling off foreclosures I don’t think they will pay anything because there won’t be taxable gains on the real estate transactions. In general, it’s not clear to me how this will impact corporations selling real estate. Can anyone provide more details? “Income tax reform” is likely to happen quickly, would the “long term capital gains” be taxable also — for those fortunate folks in the higher income tax bracket that have resided for many years in their residence — in addition to the 3.8 % tax on the sales transaction? since it is an idea just in the formulation stage. I’m a little leary about the whole situation in California and what all of it means investment-wise. Because of the 3.8% Obamacare tax, and the cap-gains tax if you are lucky enough to have a taxable gain AND the likelihood of an increased property tax in California (whether the investment has made a cap gain OR NOT), and the prospect of rising interest rates very soon now, could it be that the “shadow inventory” will be increasing rather than decreasing???? Perhaps it’ll be a long while before that “shadow inventory” becomes manageable. Larry – to clarify, the 3.8% tax would apply only to the capital gain involved in the transaction. Your income must exceed the $250k threshold (for married filing jointly) and the gain in equity must exceed $500k. Here’s an example from the National Association of Realtors. As far as the shadow inventory increasing due to taxes, rising interest rates, etc – I think it is possible but I really have no idea. Outcomes of tax policy debates and interest rate movements are too difficult to predict and too many other factors enter into the equation. In any case, in my opinion, it will indeed be quite a while before the shadow inventory moves through the system. If we get a double dip it will certainly add time and pain. So would this apply to someone who foreclosed on a home as well ? Say Purchased a home for $300,000 at the heighth of the market borrowed say $700,000 and let it go to foreclosure in the first year that this was effective. Would get a 1099 for the $700,00 if sold for $300,000 as distressed property. Would then have a taxable gain of $200,000 if married and maxed the $500,000 exemption. Then would how capital gains on $200,000 and an additional 3.8% for ObamaCare ? Hi Doug – not sure I follow this example but I’ll try to reply. If you purchased a home for $300k and sold it for $700k then your capital gain would be $400k. Since that is less than the $500k maximum gain for a primary residence you would *not* owe any tax on the transaction. No capital gains on the transaction. And no 3.8% tax for ObamaCare. If I’m not interpreting this correctly please feel free to clarify and resubmit. My math was incorrect I was trying to show an example where you made 700K and then of course had a 200K capital gain in my example. Fingers go slower than my brain when I type…. Debt forgiveness is treated as ordinary income, not capital gain, so the phantom health care tax is not on anyone’s horizon with a short sale or foreclosure. foreclosures are not debt forgiveness, short sales may be and in some cases a lender may issue a 1099 for the deficiency if they choose. This is a long standing part of the tax code, and it is not going to be changed any time soon. As a taxpayer and homeowner I would add I personally think it is fair. It seems to me that the banks and the FDIC are both basically broke. If the banks recognize their losses, they’re insolvent; if the FDIC has to take them over, its insolvency will be revealed. They instead have been picking off small banks as they can manage them. With respect to protecting neighborhoods, TARP was another massive misallocation of capital. It should have been used to protect the borrowers, by buying the loans from the banks at an 20% discount. If they don’t like the discount, don’t protect them. For the amount of TARP, the government could have then acquired the house, leased it to the present owners at a fixed % of income and maintained the house, thus protecting the neighborhood and offered a 5 year buyback at the government’s cost. The money would have been better spent. Interesting idea about how we could have used the TARP funds. Thanks for sharing! When a bank is taken over – its not always because they did something wrong…it could be profit motivated as there are bids on these banks as they are going down. Thanks for sharing this link to the npr story! Interesting angle. Great article and comments, in a nut shell it’s all about the almighty dollar, corporate profit margin and share holder appeasement. Let face is this last go round has been in play since the Q3 2008. If todays “shadow inventory” were released as the homes went into foreclosure, the majority of them would already be through the system and the real estate market of this country would better road to economic recovery. The bail out of the financial market was nothing more than a band-aid over a gaping wound to sure up banks for the spareholders and profit sharing at the top, with generations of Americans footing the bill through the national debt. All they care about is their wallets not the resulting effect on the economy and the stagnation thereof. As for as the “government” it is controlled by corporate lobbyist and foreign investors, not the people of this country. Kevin – thanks for sharing your thoughts! Greed is a big factor indeed. There is a house across the street from mine, that has been in foreclosure for over 4 years. You can imagine how much this house deteriorated. Vandales broken in several times. This has causes the neighborhood values to go down big time. What can we do about this problem. Sue the bank to get them to sell the property ? How much longer is this property going to be sitting like this ? Suggestions anyone. Scott, have you thought of contacting the city you live in? Usually the City will step and fine the owner(s) for blight and neglect. And do you mean the bank now owns the property since it has been in foreclosure for 4 years or that it has not gone to auction? I am from the land of fruits, nuts and flakes, aka California so our foreclosure process may be different from you. Where are you? Tina – thanks for this reply to Scott. Are you seeing anything similar in your community in California? With this type of situation, we are now having to deal with squatters. This has become a problem in our area. In fact I am Vice-Chair of our Homeownership Opportunity Committee with my local board of Realtors and our round table this Tuesday is on squatters and is your vacant home really vacant. And there’s a more serious concern with those that believe that vacant property are theirs for the taking under “adverse possession”. They will go to the extent of filing documents that cloud title, and then sign leases with “renters” to take care of the properties. They have even been known to pay the property taxes. Tina – thanks for sharing this. In Colorado I have heard of scams whereby someone will claim to own a home and advertise it for rent on Craigslist. Most people realize something is fishy when they show up to find a lock box and the standard foreclosure-related stickers on the door and/or windows. But, I’ve heard of instances where someone was moving in having paid a deposit only to find that they’ve been taken. It’s crazy out there. Until the bank takes title via a sale and completion of the foreclosure, they are not the responsible party. A common tactic in areas where the bank does not want to own property is to not take this last step and avoid the responsibility of ownership. About half the states in the US have judicial foreclosure: a court is involved in the process and in these states foreclosure takes much longer. So true Dave and California is a non-judicial state, although they do happen once in a while, very rare. I live in the Bay Area and most of the banks who take their properties back have asset preservation companies that come in and take care of the properties, i.e. mow the lawns, initial interior cleaning, etc. Although now I am hearing stories where these type of companies are popping up and attempting to ripping off the banks. They’re billing for work they claimed to have done, except the work doesn’t match the properties! Tina, thanks for your response. The city has been called several times about upkeep and repair. The property is just secure now, but is major eye sore. And it hurts surrounding house values. UGH…This is in St. Pete Florida. Glad to hear the property is secure. Must be frustrating to see that everyday! Do you know if the city has fined the owner of the property, maybe placed the fees on the tax roll? I just stumbled onto your Banks are Destroying America’s Neighborhoods article and I have to say I think you are right on target. I too am from Pueblo, CO. In fact I am still here and I am selling real estate so I have seen all of this first hand. When you see people living in a property for three or four years since their last mortgage payment you just wonder what these slow moving big banks are up to. Their greed has put us all at a very high risk. The sunny spot over Pueblo seems to be here. We are seeing good activity and signs of encouragement. How about we write our congressman and get them to force all banks to post the average time between NOD, Short Sale and Foreclosure. They must also post the longest foreclosure and Short Sale and the Shortest with an explanation. A depressed property rating system. This would be the least our congressman could do for us taxpayers since we will be paying for this for decades. Let me know if you have a link you’d like me to share to encourage people to act. Thanks for the comment! -J.
I believe the stock price, management and shareholder protection theory is a sound one. The accounting treatment for an REO property is to initially record the asset at the lower of 1) recorded book value of the loan or 2) fair value less costs to sell the asset. It’s easy to see why a bank would want to keep a home on their books for a long period of time to delay the inevitable loss they would have to account for if an REO property is sold at the usual discount to a normal property. Thank you for the comment, Joe! There used to be rules under GAAP that banks had to accurately report their financial condition. Losses had to be written off in 90 days, division executives were held accountable and if caught “cooking the books”, they were terminated. This behavior borders on criminal and I agree that America’s housing crises is being extended by this shadow inventory, an unwillingness to take the hit, albeit a large one. They are destabilizing local neighborhoods, home values and delaying the recovery all for the sake of shareholder value. Just another good reason to invest in real estate, an asset you can control versus the stock market…a rigged game. Justin, Great article and Blog. You have hit the nail on the head. I’m in the Phoenix market and my head is exploding by the excitement I hear from Realtors and Mortgage Bankers about how incredibly BUSY they are, 18 offers on properties, Whoopee the market is back!!! Don’t they see that the manipulation of the market continues, the Banks are holding back thousands of properties in our market, controlling available inventory and ultimately pushing prices back up in the Phoenix Market. After more than 20 years in Mortgage Banking for a Top 5 bank, I left banking in 2008 and have been working hard on the side of the consumer/middle class Americans who have all but lost it all due to the Greed that is so prevalent in our Banking system. It is time the banks take their haircuts, let the market repair itself naturally and stop playing games. Thank you Rene! I appreciate your comment. Great to hear positive feedback from someone who has seen both sides of the equation. Banks are not under the federal government control. The federal government loaned them money. They run their own shows. As sleazy as it is. History shows us that we need more regulation…not less. Yes, But they are some of the major contributor’s to those that regulate them. Soundls like someone put the fox in control of guarding the hen house…. Hi Michael – thanks for your comment! Interesting perspective. I think perhaps I’d rather see laws that tax banks and other non-resident owners at a higher rate when a property is left vacant. But, perhaps credit reform is a key piece of the puzzle as well. Thanks again! Cheers, J.
Foreclosures in some states have been slowed down because they are required to go through the courts. We have this process in NJ, and it has hamstrung house prices here for seven years. I know, because we just sold our home in Dec. for a fire sale price because, at this point, we just want to leave NJ. States like GA have had greater rebound in their prices because the foreclosures have not required court involvement and thus have happened more quickly. Do you have judicial foreclosure in Colorado? That could be part of the problem. But I do agree with you that the banks are dragging their feet on selling homes. Anyone who has tried to buy a foreclosure or short sale know that these folks play all kinds of games, and don’t seem to care at all about selling the homes you’d think they’d want to sell, as banks historically do not want to hold foreclosure assets. Your explanation re: the desire not to recognize losses makes a lot of sense. I get the impression they’re all playing a kind of game of chicken with each other, in the vain hope that, the longer they delay sales, the more prices will rise. Just incredibly stupid and short-sighted. Colorado is non-judicial. I think properties are moving more quickly through the system than they were when I originally wrote this post. No thanks to banks. I think mostly it’s because the volume of foreclosures has been steadily declining back to more typical levels. “If the banks are no longer able to hide their impending losses, hopefully they’ll do a better job of processing foreclosures more efficiently so American neighborhoods can begin to recover.” Hopefully. Thanks for sharing. Learned a lot, especially from the comments.